MSFF. Photo by Josh McLeod. For me, the Montréal Stop-Motion Film Festival this weekend was an eye-opener. Having never been to any sort of film festival, it was a new and engaging experience. 88 films were presented in the competition portion in three categories: academic (which are done in a University or collegial setting), independent and professional. I focused mainly on the films that are competing and the special presentations of the festival in the independent and academic categories. I entered the McConnell building of Concordia University and found myself a place in line. At first there weren’t many people but it didn’t take long until the lines quickly piled up and a considerable number of people were all eagerly awaiting for the festival to begin. Once everyone chose their seats, Festival director Erik Goulet took the mic. His energy won over the crowd as he jumped from his native French to English at unimaginable speed, acknowledging the contributors and listing the events to come in detail. The jury members for this years event were Michel Breton, Micheal Hollenback and Laurie Sitzia, all of whom are deeply rooted in the Stop-Motion community. Laurie Sitzia’s Puppets. MSFF. Photos by Josh McLeod. PES then took centre stage and brought festival goers behind the scenes into some of his most famous personal pieces while also taking the time to look at some of his commercial work. Problem solving and ingenuity were at the heart of his discussions and he backed these up with examples taken from his food trilogy. He really took the time to break down selected scenes in a way that was both accessible to everyone and very informative even to the seasoned animator. Hilarity ensued when he explained his method in The Human Skateboard. He then talked about his latest project for Honda, Paper, a mesmerizing feat of stop motion involving the intricate use of paper to literally retrace the history of the company. Afterwards, he followed up with a very casual Q&A and the night that ended with cake and cider at the John Molson building. I arrived at 9:30 for the Meet the Filmmakers event. Here I got the chance to see some of the festival’s contestants and got a first look at some of the entries. This session gave select filmmakers a chance to talk a bit about their projects and some even brought their puppets. 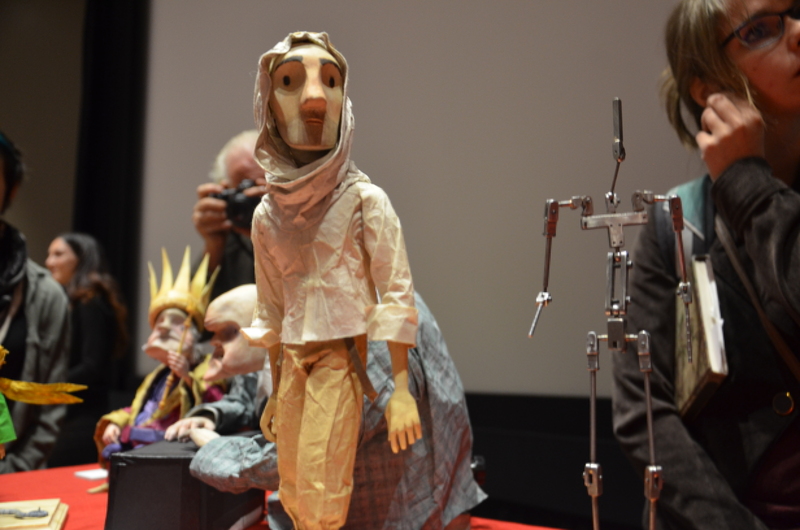 The puppets from filmmaker Ben Cresswell’s The Armadillo & The EarWig (UK, 2015) were particularly interesting. 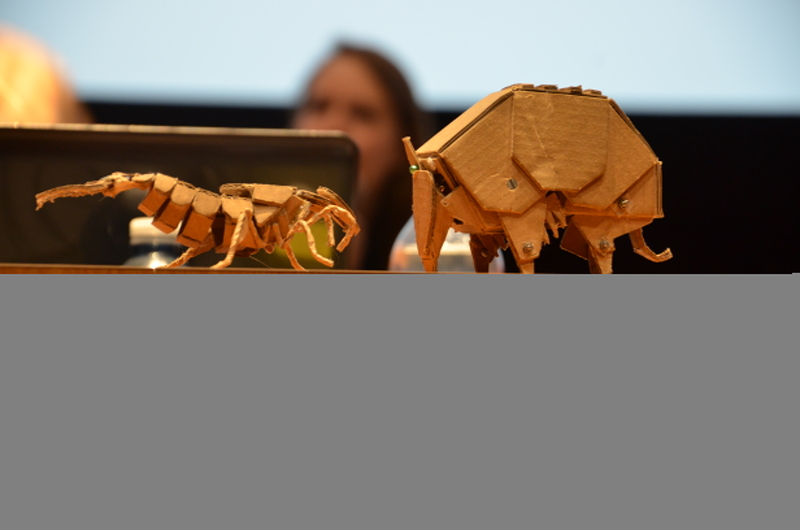 Two quasi-origami puppets with a cool aesthetic, made mostly of cardboard. It was a nice way to generate some excitement before the actual screenings commenced, even though the crowd consisted mostly of the filmmakers themselves. The first category was the academic screenings. The talent exhibited by these student filmmakers was quite remarkable. 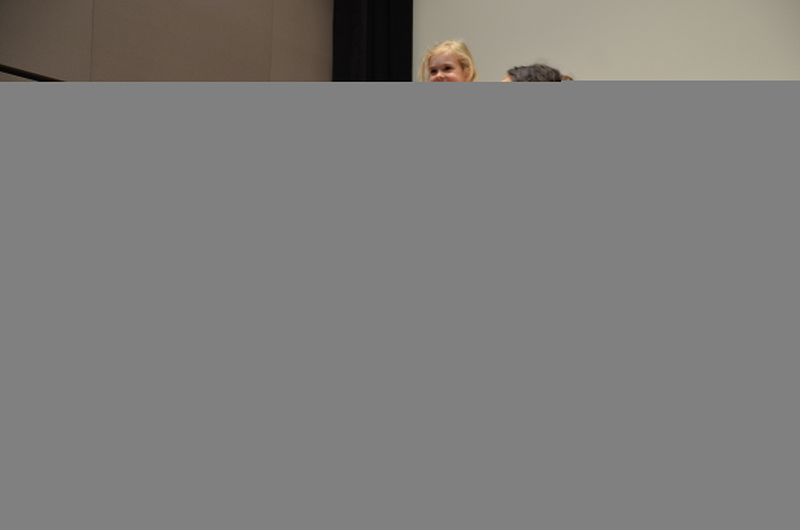 The opening short, The Moustache (Finland, 2015) by filmmaker Anni Oja was an excellent start to the programme. This very Looney Toons-esque duel of rival moustaches got a lot of laughs from the crowd and features some complex hair animation. Another light-hearted film that drew my attention was an entry from Spain entitled Azul (2015). This cartoony short by Lula Gómez and Jordi Piulachs was uplifting and had an empowering message on the importance of diversity. On the opposite end of the spectrum, Nicholas D’Agostino serves up a dark and thought-provoking glimpse into the human condition in Ring Around the Mulberry Bush (USA, 2015). This realistic exchange between two broken individuals is honest, powerful and sets the bar high for the rest of the entries. The film that struck me the most however had to be Ab Ovo (Poland, 2015) by Anita Kwiakowska-Naqvi. This intimate and moving film depicts pregnancy in an abstract manner. I sensed a duality with moments of humour and joy cut by images of pain and suffering. It brought forth a sense of ambiguity which I thought to be interesting and subversive. Next came the independent screenings. This category started off on a wonderfully dismal note. Automatic Fitness (Germany, 2015) by Alejandra Tomei and Alberto Couceiro is a “tragicomedy” which parodies our ever-increasingly accelerated society. This duo literally puts humanity on the conveyor belt and totally reimagines the chaos of everyday life through an effectively hilarious lens. The film that struck me the most however was Canis (2013). Directed by Spanish filmmakers Marc Riba and Anna Solanas, this short was in my opinion the black sheep of the entire festival. It was dark, weird and at some times very off-putting. I will even admit that I didn’t really like it at the beginning. I was actually feeling kind of ill. But sure enough, I began to appreciate every moment of this dark and provocative tale. It was like Cormac McCarthy’s The Road meets Cujo, in a visceral and tragic coming of age story. The textures, sounds and music come together to paint a morbid yet captivating picture. I highly recommend watching it at least once, however it’s definitely not for children. I wouldn’t suggest it to nana either. Cordell Puppets. MSFF. Photos by Josh McLeod. After a short break we got to see the première of Cordell Barker’s If I Was God… (Canada, 2015) along with presentations by the director himself and key members of the animation and props departments. People responded very well to the short and the mood was great. The gags hit home and I noticed numerous times audience members even giggling at nothing in particular. Everyone absolutely loved it. On top of that, seeing it presented in stereoscopic 3d was quite a treat, and it was then replayed en français. Barker and the team began their presentations, detailing key moments of the project since its conceptualization. Everyone got a glimpse into Barker’s early sketches and heard his thoughts on directing stop-motion for the first time. Laurent Canniccioni of Jako Lanterne filled us in on what it was like creating the puppets and See Creature’s Dale Hayward and Sylvie Trouvé gave a detailed presentation about the meticulous job of animating the characters and bringing Barker’s vision to life. Aviator from The Little Prince. MSFF. Photos by Josh McLeod. 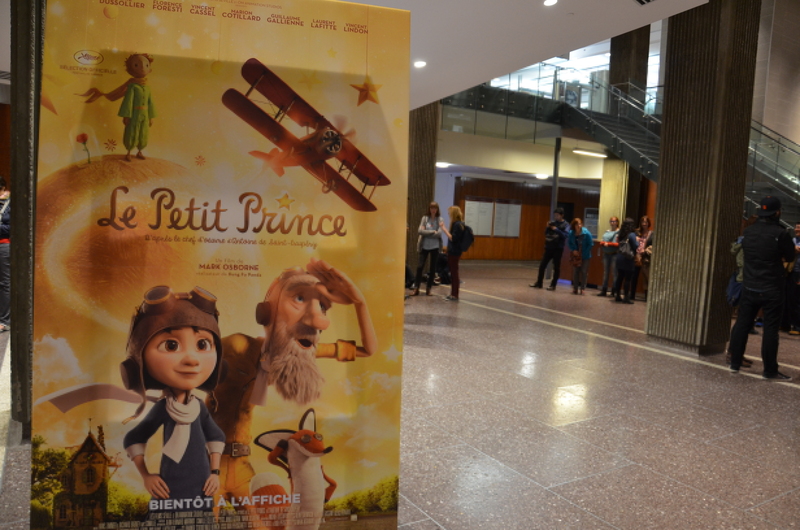 Festival goers then got an exclusive behind the scenes look at Mark Osborne’s The Little Prince (2015 in North America). Afterwards, it was Erik Goulet’s turn to present. He dealt mainly with the evolution of the armatures he and some of his former students created for the feature. He shared an innovation in the construction of the feet and ankles he developed himself, to give a more life-like cadence to the movement of the puppets. Alexander Juhasz then took the mic and took us through his creative process of designing the look for the puppets (with a hilarious commentary on St-Exupéry’s original sketches) and what it was like being Stop Motion Production Designer on the film. Dale and Sylvie returned to the stage again to talk animation, letting us know See Creature has been hard at work the last few years. They concluded with a Q&A and let fans see the main cast of puppets up close and personal. This was a great deal for many who have known The Little Prince’s tale since childhood. The final day of the festival began with the second portion of the independent entries. Once again, I was really blown away with the quality of the entries and their compelling storytelling. Junk Head (Japan, 2003) by Takahide Hori was by far the longest and most dense as far as plot details. It was a very immersive experience. I felt a part of this eerie Giger influenced world and there added is scope created by the various environments. The stellar creature design kept me interested throughout the entire film. Chris Walsh’s The Shutterbug Man (Canada, 2014) was a pleasant surprise for me as it was the only entry that was a full-fledged horror. It effectively created an intense and chilling atmosphere and in my opinion, the short format lent itself well to the genre because it wasn’t bogged down by unnecessary explanations (which happens frequently in feature-length horror film). In other words, the narration gave just enough detail while maintaining a haunting sense of mystery. Screen fatigue was starting to kick in around this point and the next break was welcomed by all. After all, I did view over 50 films in the last 24 hours. The last category with about 30 or so films, was the professional category, and I was excited to see how they would differ from the academic and independent. As it turns out, this selection of films impressed me less overall. That’s not to say they weren’t good. In fact, the really distinguished of this group were amazing. I just felt that the higher production values (which were quite evident) did not make up for a lack in storytelling I felt from some of the professional entries. In other words, some of the professional entries, even though they looked better and had smoother animation, often had a meandering story line and I didn’t feel as engaged as I was during the earlier screenings. That being said, I thoroughly enjoyed the hallucinating visuals of OTTO (2015, Italy) by Salvatore Murgia and Dario Imbrogno. The tightness of the animation and the corresponding audio created a surreal experience and it features a cyclical plot line (interestingly, this type of narration seems to show up often during the festival). The simplicity of the colours and with the complexity of the animation, together with a glitchy soundtrack made this one a real feast for the senses. The armadillo and the earwig. MSFF. Photos by Josh McLeod. 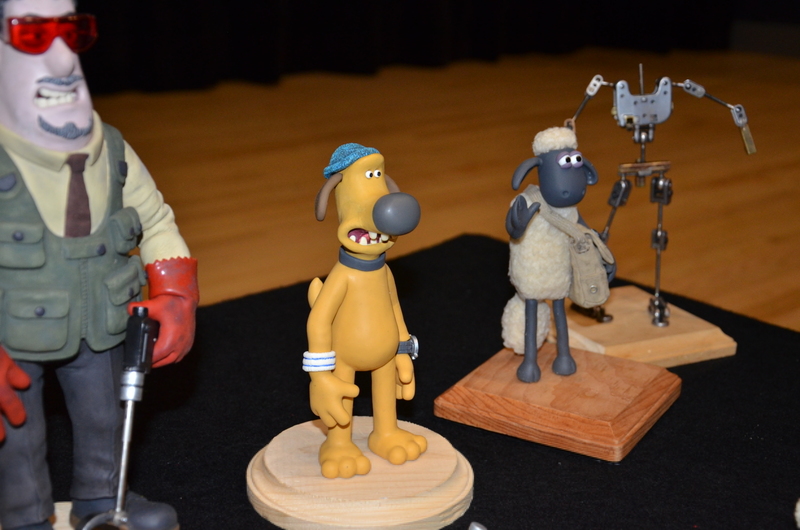 In between the two professional categories, festival goers were delighted with a special presentation by Laurie Sitzia of Aardman Animations who came to talk about the Shaun the Sheep Movie. Laurie took us through the various production phases of both the sets and puppets and recounted the hardships of dealing with the animation of a multitude of characters. She then let audience members see Shaun the Sheep up close along with the rest of the main cast of characters. To everyone’s surprises, Laurie announced that one lucky fan would win a framed sketch of Shaun. Afterwards, the final screenings of the independent category began. The music video Text Me Merry Christmas (Canada, 2014) is Alexander Gorelick’s cautionary tale of the state of disconnect between people in the modern world. Well received by the crowd, it left me under the impression that many people could relate to this story. Although it is very funny at times, it carries an extremely important message about how people maintain relationships. Fairy Tale for Average People (France, 2015) by filmmaker Chloé Mazio was a whimsical and imaginative piece about a man dealing with a devastating breakup. Although Mazio relies heavily on randomness to generate humour and created this unbelievable world, it wasn’t too alienating because much of it felt metaphorical. It was the first pixelation piece I really enjoyed and the expressions of the actors helped with the delivery of the gags. Samuel Lewis’ Colourblind (Australia, 2014) is another dazzling visual metaphor on the tension between opposing forces. Beautifully simple, I felt this piece had the most cinematic moments of all submissions. It seemed almost as though every frame could hold it’s own weight as a stand-alone image. Also, it was well thought out and it left much room for personal interpretation. For my own part, I saw the tension between Humanity and Nature, with Humanity’s destructive qualities embodied by the dark figure. Finally, it came time to announce the winners of the festival. Taking top prize for the academic category was The Moustache (Finland, 2015) by Anni Oja. In the independent category, the winner was Once Upon a Blue Moon (UK, 2015) by Steve Boot. The winner in the professional category was If I was God… (Canada, 2015) by Cordell Barker. And the winner of the people’s choice award went to Automatic Fitness (Germany, 2015) by Alejandra Tomei and Alberto Couceiro. 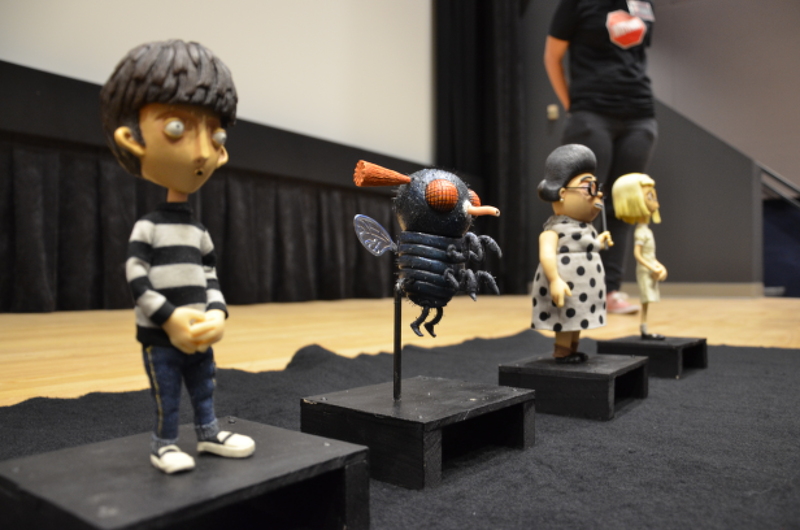 My experience at this year’s Stop-Motion Film Festival was unforgettable. I highly recommend it to anyone who has a love for film, not just stop-motion. 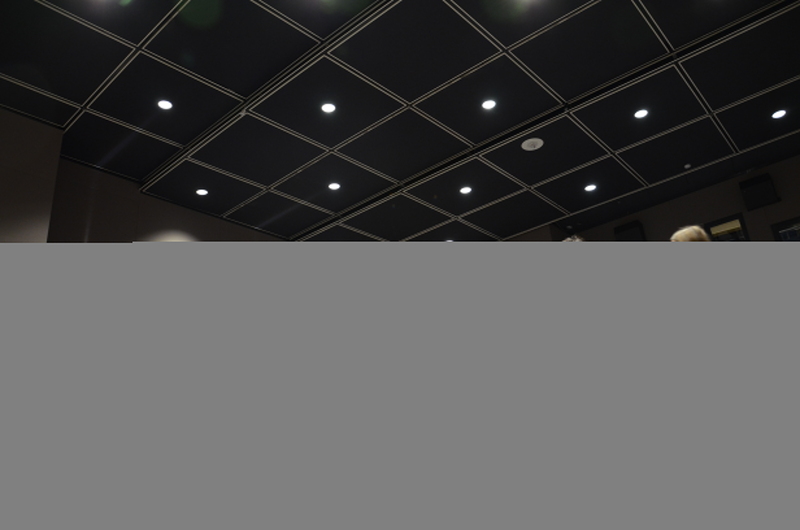 The variety in films ensures that there’s something for everyone and it engages people of all ages to really immerse themselves into this world of animation. I am definitely looking forward to next year’s iteration. Click here to view more photos from the festival.